It has an optional keyboard. Not a separate bluetooth keyboard. Not a keyboard case. An actual keyboard that it snaps into and then can close with like a clamshell, so many people mistake it for a netbook. The keyboard was the sexiest feature for me, since I wanted to use the tablet to replace my notebooks: at work, at home, and online. Just kidding on that last one. Sort of. You can actually see my full list of reasons in my post: More Than Meets The Eye. Actually, I thought long and hard about my move to a tablet. And so should you: Tablets generally run around $500, so you'll want to invest wisely; choosing the wrong piece of hardware could make for a very expensive mistake or unnecessary expense. Since I bought my tablet, quite a number of people have cornered me at meetings, conferences, coffee shops or generally anywhere I use it, to grill me on my reasons for choosing this particular piece of hardware, and most importantly to figure out if they need one too. It's believe that tech purchases are very personal decisions, so I in turn usually grill them on a number of factors to help them with their decision process. I find the following 5 questions useful in taking a methodical approach to determining what tech you really need. 1. What issue are you trying to solve? Reclining on the couch, using it as a second screen to interact on social networks while watching TV? Substituting your paper notebooks at work, conferences and for drafting docs like blog posts? Accessing email and contacts remotely, on a larger screen than a Blackberry or smartphone? Skyping and using social media? Organizing your life in a single device? Now you might be thinking: Oh! I hadn't thought about some of those, they all sound good!!! Caution: when it comes to new tech, it's tempting to justify the expense by making up potential uses. I'll bet that if you're honest with yourself, there are only a couple of reasons why you initially started your research. Keep those front of mind. For me, my initial instinct was to replace my work notebook: I had a very demanding client who often went back on decisions. I needed CTRL+F to revisit notes on various projects but you just can't do that with paper. And my job didn't afford me the time to transcribe my meetings notes. Given that I was already using Evernote on my desktop to organize my work, I wanted to use it to replace paper notes entirely. And because I type quickly (pretty much verbatim), a physical keyboard was important for me. So that was the catalyst for me. What was that catalyst for you to consider buying the tablet? The last question was about the gut instinct that made you consider the tablet as a possible tech purchase. This question is more about the when and where that you will use it. In design, this is called "context of use" and the key to thinking about this is to, again, not let yourself get carried away about all the ways in which you can imagine using it. Keep yourself focused on why you wanted it in the first place, and evaluate how and where that purpose would play out. These questions are important regarding the physicality of the tablet: thickness, weight, screen size, required accessories, etc. At home? Would you let the kids handle it? Where will you use it the most: on your lap? in the kitchen? in your home office? On the go? For downloaded content or to create content? Does it need to fit into a purse or would a case be enough? Do you need to be connected all the time? Would you just use wifi or would you want to pay for a data plan for your tablet in addition to whatever you have on your phone? How much memory do you need? Do you plan to use it to store content or are most of your apps cloud-based (Google apps, Evernote, Apple iCloud, etc.)? memory capacity wasn't an issue since I store pretty much everything in the cloud. So, when and where will you use it? Figuring out where and when you will use your device will make it easier to determine the technical specifications for the hardware you need. 3. What other tech do you use? Do you need to be able to share content between them? The point of this question is to determine if you need compatibility between your devices, and or consistent apps; it will help you determine if you need to stick with the same brand or operating system as your other devices. If your life is in the iCloud, then what will be the opportunity cost of getting an Android tablet? Will you be able to run iTunes (probably only using some third party, unsanctioned app)? You'll need to determine whether there is any risk to shopping in other brands and OS' that feature a different set of apps and cloud platform. Can you use a Blackberry for email but use an iPad for everything else? Lots of people do it. 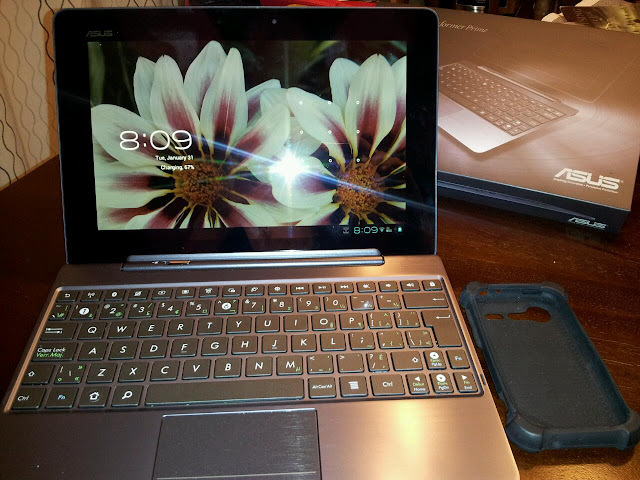 Hubby has a Blackberry and Xoom tablet (Android), while I prefer the consistency of having an Android phone and tablet. Given that I prefer free apps, it's important that everything between my devices is available in the free section of the Google Play store. And before I start using some app that becomes indispensable to me on one of my devices, I want to check that it works on both when their OS are out of sync (for a while my phone was on a lower OS than my tablet). So, if you're out of sync between your devices, will there be any impact to your goals for using them? 4. Are you a content creator or a content consumer? If both, which do you plan to do on your tablet? This is the money shot, right here. THIS is the question that will determine whether or not you need a tablet or a laptop. Are you a content consumer or creator? Which do you do more on a regular basis? Perhaps you are a more occasional producer, and prefer to read articles, watch videos, browse magazines, and play games. Based on your answers to questions 1 and 3, deciding what you intend to do with the device is the key driver to determining what kind of tech you need. Or if you're like me: I curate a lot of content, meaning I subscribe to a lot of RSS feeds, but let's face it, that's a single app: my RSS reader. The rest of the time, I'm engaging on social media, researching and writing blog posts daily, managing email... I need a device that is much more suited to output than consumption. Once I started thinking about a tablet with a physical keyboard, I got excited about using it to replace my laptop entirely. Blogging! It will be perfect for drafting and posting blog posts! Turns out, not at all. In fact, blogging with tablet drives me insane. You see, most mobile apps just aren't as robust as their desktop OS versions. Even mobile photo editing, web development, and design apps (aka the blogger's bread and butter) are not nearly as fast or feature-rich as desktop versions. Here is what it's like blogging on my tablet: from researching online to drafting a post in Evernote, to downloading photos, to coding, to uploading photos to Blogger, tagging and scheduling, it can take up to 4 times as long on my tablet. If I have a post written, it takes me about 15 minutes to do the rest of the work on my laptop. Given the lag in response time and the slower apps, it can sometimes take me an hour to do the same chore on my tablet. In certain circumstances (like the Dude's diving class or road trips), I don't mind at all. But at home, on the couch, it drives me nuts and I almost always reach for my laptop instead. Another example: for reviewing Microsoft Office documents, I spent the money for the tablet version of DocsToGo. It works well, but it takes a lot longer and the view isn't as user-friendly as the desktop versions of the Office apps. They're slower, have fewer features and you have to use your fat fingers to do all the work versus the precision of a mouse. And yes, I keep using the term "mobile" because even though a tablet might look like a laptop when you stand it up on a keyboard... it's still running a mobile operating system. It's slower, less responsive and doesn't boast the processing power of an actual personal computer. Even browsing the web is a little slower, especially if you have a bunch of tabs open or are running a number of apps in the background. And that's why I had you answer all those questions first. Depending on what you want to do with the tablet, depending on how and where you envision doing that task (or set of tasks), it will determine whether you need the processing power of a laptop or the convenience and portability of a tablet. 5. Do you need both? Maybe, but which do you buy now? And perhaps you need both. But which do you need to buy? Do you have an older piece of hardware that needs replacing or are you looking to supplement your devices? In my case, a laptop wouldn't have been portable enough to bring on the bus with me back and forth to work each and every day; too heavy, too big and redundant since I already have my old laptop at home and a perfectly working one at work. And I decided that my older laptop had the processing power we needed at home for the Dude to play Minecraft and for me to manage websites. So instead of replacing it with a new laptop, I preferred to get a tablet with a full keyboard that met almost all of my needs (except the daily blogging one). In the end, it was the right choice for me.